Turn up the brilliance of every strand with Moroccan My Shine Conditioner. With exotic Argan Oil, this pH-balanced, color-safe conditioner is the answer to restoring head-turning radiance. This rejuvenating formula is made with 0% parabens, gluten or mineral oil. Massage into freshly-washed hair, rinse and look luminous from the moment you step out of the shower. Instructions: Apply generously to wet hair from root to tip, then rinse. I Feel Like This Product Was Made For Me! I have tried most of the Herbal Essences range. They are all great but had something lacking. Eventually I got round to buying this shampoo and conditioner. I was great! I now only need to wash my hair 3 instead of 5 times a week. I love the glorious, fruity, argan oil scent. I feel like this product was made for me! Wow, this is amazing. Made my hair soft, hydrated and so shiny. I purchased the Moroccan My Shine Nourishing shampoo and condition and I am blown away by how well it works. My hair went from gross and dry to healthy, hydrated and shiny. I have gotten several compliments on my hair too. I like how affordable this is. I have always liked the Herbal Essensces product line, and this fits in well with it. Smells great, leaves my hair soft and silky yet manageable. I would definitely recommend. I tested This item for free, but all opinions are my own. I tested this product for free for Influenster. 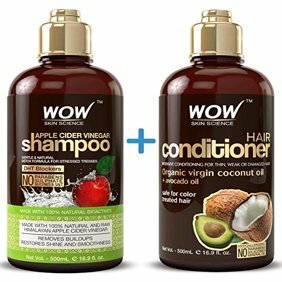 I tested this amazing conditioner on my hair. My hair is color treated, curly and mid-length. This conditioner had my hair feeling healthy, shiny, and smelling great. I've been using it for a little over a week and my hair has never looked better. I also use this condition on my daughter's hair and her hair is super smooth, healthy, and shiny.